ArticlesAmrendra Pratap Singh – Progressive farmer from Uttar Pradesh. 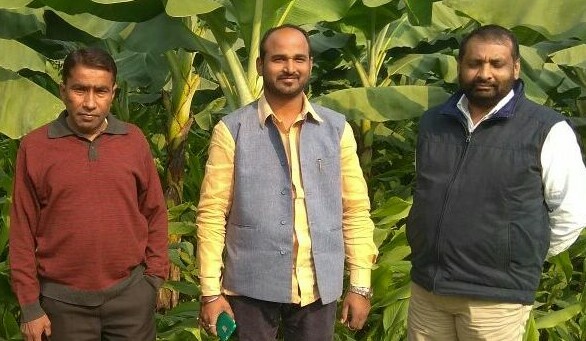 Amrendra Pratap Singh – Progressive farmer from Uttar Pradesh. “In our Indian society general public doesn’t believe that through farming people can earn annual income more than any corporate job and that too without long working hours, stress and politics. Unfortunately farmers’ are mostly in news either for bank debts or suicides! Consequently farmers have a poor recognition in the society unlike other professionals. I have my own share of unpleasant experiences of being a farmer. However, determined to change the farmers’ image in the society I decided to do something different than traditional farming thus started hi-tech farming,” highlights Mr. Amrendra Pratap Singh, progressive farmer from Daulatpur village, Barabanki district, Uttar Pradesh. Annual turnover of his farm is approximately Rs. 1 Crore and net profit is over Rs. 30+ lakh/year. Mr. Amrendra inherited traditional farming and owns more than 50 acre farmland but to bring in the desired change he started technology driven farming in 25 acre. He established an integrated farm with tissue culture plantation of banana, watermelon and melon, mushroom cultivation and broiler poultry unit. 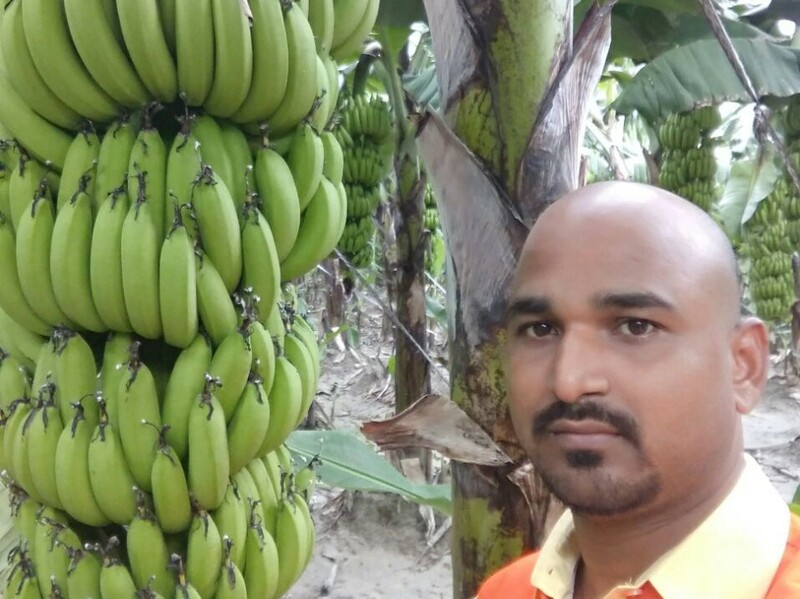 He started new-age farming in 2013 with banana cultivation in one acre. 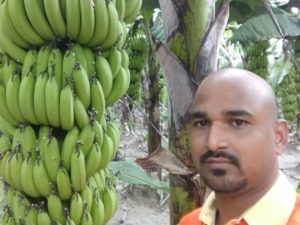 With the profits earned he expanded the acreage of banana cultivation to 20 acres and also started growing watermelon and melon. A year later he diversified into mushroom farming and then poultry unit. “In my farm, for mushroom cultivation we prepare beds from the wheat straw and compost of poultry droppings. There was a regular requirement of poultry droppings so we decided to set up a broiler poultry farm. In this way one venture led to other and today we have a well-interlinked integrated farm,” he shares. Growing crops is a natural science in which every element has some specific purpose and use. This basic principal is well understood by Mr. Amrendra. In this way he is not only able to increase the farm revenues but also reduce the production cost thereby the profits are increased. “Post harvesting wheat, the straw and poultry droppings are used for making the mushroom beds. Next, after harvesting mushrooms the left behind beds are processed into compost that is fed into banana, watermelon and melon plantation as manure. It has become a complete cycle that functions in routine,” he explains. Banana tissue culture saplings are sourced from Jain Irrigation Company. Banana produced is uniform in respect to shape, size, colour and taste. “Besides entire produce is harvested at the same time thereby it is easy to sell in bulk. It is mostly sold in Punjab and Haryana. 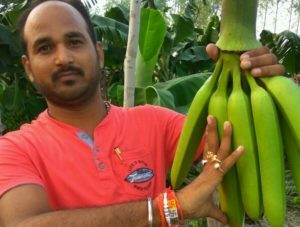 These states have high demand of this banana variety,” he shares. Once the saplings are transplanted it yields for two years and then after the plant needs to be changed. Turmeric or ginger is grown as intercrop with banana. Watermelon and melon are grown in shade net. Seeds are procured from Taiwan based company. “The fruits are harvested once in a year. It is sold in Lucknow and Faizabad, Uttar Pradesh,” he says. The broiler poultry unit was started in April 2016 with the capacity of raising 2000 chicks. Mr. Amrendra doesn’t believe in binding himself in any contract therefore open to risk, he sells the birds on his own to the bulk buyers. “We do it all by ourselves, right from purchasing the chicks, feed, medication and selling the adult birds. In one year we are able to complete 5-6 rounds. It is a good add-on income for the farm,” he asserts. Button mushroom is grown in one acre area. It has the mix of permanent and temporary sheds. “The production capacity of permanent shed is 400 quintals while each of six temporary units gives 100 quintal production,” he informs. To improve farm revenues and expansion is always in mind of Mr. Amrendra. His immediate plan is to set up a special unit to vacuum pack mushrooms. “With the vacuum packing we will be able to store mushroom upto one year. Presently the day we harvest we have to sell mushroom as it has very low shelf life irrespective of profit or loss else it gets spoiled completely. Usually in winters there is drop in mushroom price while in summers it appreciates therefore with this new unit we shall be able to sell when the price increases,” he reveals. In future he wants to establish a FPO after the fellow farmers in his village become stable in their respective farm operations. “Value addition fetches better returns but doing it at individual level is not commercially viable. So once a fixed number of farmers in the village attain regularity in their farm production we shall register our FPO and sell the products of entire village-farmers under the same brand name. We shall have the authority to fix the price of these products taking our production expenses into consideration. With FPO certainly farmers will earn consistently and get genuine respect in the society however as this is a group activity it shall take time to come into existence,” he shares. Mr. Amrendra is an educated farmer and quite inclined towards using technology as support system. “Undoubtedly problems in agriculture exist but waiting for government to solve it or wasting time cribbing about it is no solution. I believe in fighting by own battle using my intelligence. I strongly believe we have best of resources and fertile soil that have the potential to feed not only India but the world’s population! Countries like Israel and Taiwan are so small in size and have so many limitations yet they are renowned in the world for agriculture tech solutions then why can’t we in India? Farmers are the land owners hence there is no need to feel insecure or take commit suicide. All we need is to walk on our own path of success solving all the hurdles all by ourselves. Income will increase and surely soon society will recognize farmers with umpteen dignity,” he signs off.